Gift vouchers with amount 40 Euro. After purchasing a gift voucher will be sent with the voucher code. Gift vouchers with amount 80 Euro. After purchasing a gift voucher will be sent with the voucher code. 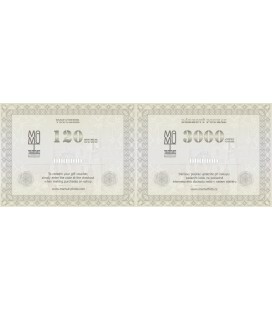 Gift vouchers with amount 120 Euro. After purchasing a gift voucher will be sent with the voucher code. Gift vouchers with amount 200 Euro. After purchasing a gift voucher will be sent with the voucher code.